These are the tools I seem to go back to over and over again. Canned air is one of my favorite tools. I use it for blowing lint build-up from my machine. Each time I change my bobbin, I spray the bobbin case, housing unit, and anywhere else that has collected lint. The cheapest place to buy it is Walmart. A long time quilting friend told me that blowing the dust out of your machine puts moisture into those small working parts. I keep these scissors by my machine. They are quick and easy to pick up since they're so light. You can find them at Walmart for $6 in the sewing section. The ends are curved, so I sometimes prefer them over a seam-ripper. Besides my rotary cutter, this is the only cutting tool I use regularly when quilting. UPDATE: The style of these scissors has changed, and they are no longer pointy enough to use as a seam ripper. Olfa Spinning, Rotating Rotary Mat 12 X 12" Square, Self Healing, eliminates the need to turn your body or the fabric on your mat. LOVE IT!! With a 50% coupon, you can get one at Joann Fabrics for about $13. Use "Scotch-Blue Painters Tape" when quilting a grid design. This "painter's tape" is available in the paint section of Home Depo, Walmart etc. It comes in several sizes (the engineer's wife must have been a quilter, cuz they're all perfect sizes! ), 1 inch, 2 inches, I think I've even seen it in 4 inches. After deciding the width I want, I lay one strip along the middle of my project, usually diagonally and sew along both sides, being careful to stay just off the tape. Then, I lift the tape off, and reusing the same piece, I measure and lay it down for the next 2 quilting lines. EASY!! 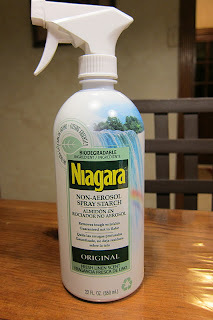 I have also added this product to my list of favorite quilting tools, "Niagara Non-Aerosol Spray Starch" recommended by Carrie @ Miss Rosie Quilts. I like to use it when I prep my fabrics to be cut. It makes cutting easier and more precise. It is cheap, and can be found in Houston at Randalls. Carrie buys it at Target, but she must have cleaned them out, because they currently don't have it. More details on that in this post. I love this tool! I've written about it in this post. I found mine at Joann Fabrics. Have you discovered tags? They make trimming strings easier. If you start with a tag, you have less issues with thread making rat tails at the beginning of a seam. When sewing triangles, it's hard to get the next set in there without messing up your seam allowance. You can use a tag, and maneuver it right in where you need it. When I go back to trim, I cut next to my tag. This keeps my tags clean, and leaves a short tail on the end of my seam to prevent that end from coming loose. 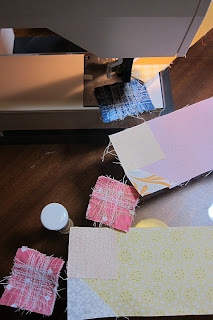 Love your idea with the masking tape - I was wondering how I was going to do that with only a normal machine not a fancy one! Thanks Linda!